We begin a new weekly series to keep our blog happily active, featuring none other than our big trees! To kick off our series, we introduce Shorea curtisii, otherwise commonly known as Seraya. Yep, that's the Shorcu that was talking to you in this blog's inaugural post on April 1st. SHORCU is our short code for the tree's full name. If you're taking a walk in the trails on a weekday and hear someone shout "SHORCU! 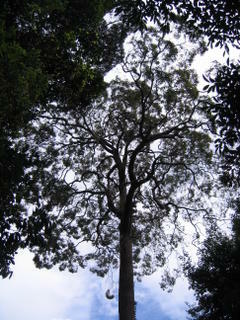 ", that's us at work in the reserve, identifying a Shorea curtisii. 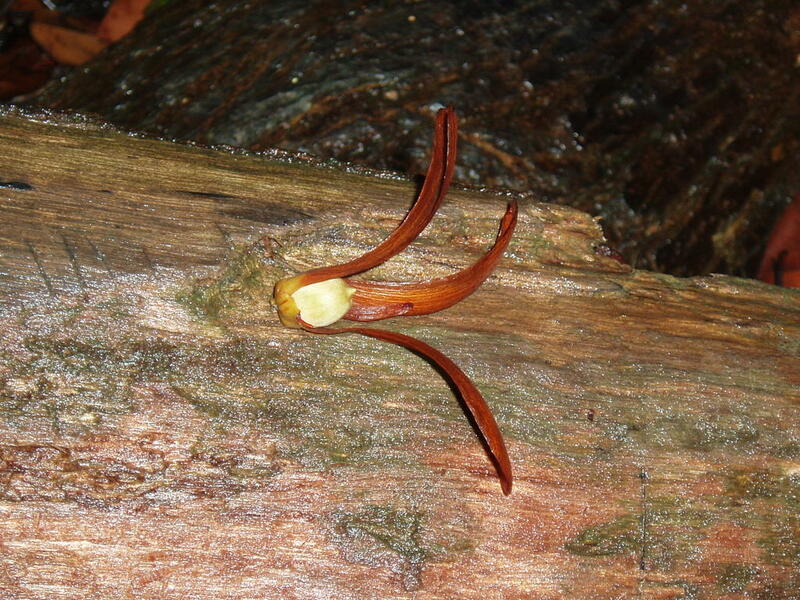 We're about one-fifth our way through the Bukit Timah Nature Reserve, and already, the Seraya tops our list as one of the most abundant species at the reserve. The species is distributed on Hill Dipterocarp Forest throughout the Malay Peninsula, from Thailand to Singapore. 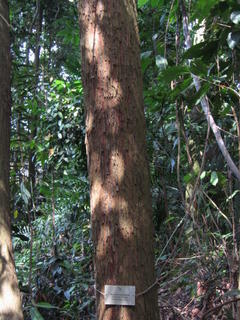 In Bukit Timah Nature Reserve, the tree is very common throughout, and very particularly so along Jungle Fall path off from the Main road. 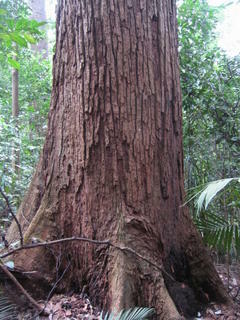 They are large trees, easily over 30cm in diameter, and we have measured many reaching over 100 cm in diameter. 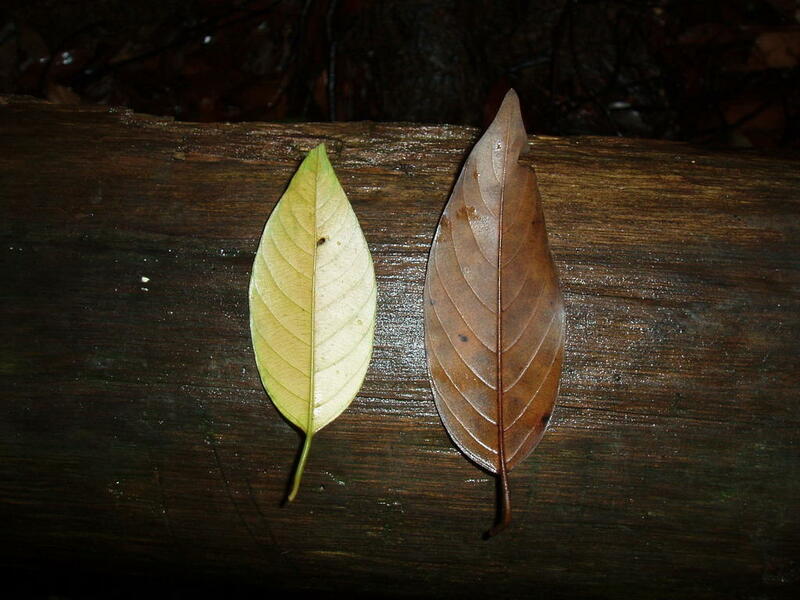 Their trunks are usually well-shaped and round, can be grey or reddish-brown, and are characteristically coarsely-fissured, though this may not be so obvious in younger trees (picture akan datang). The tree crown is light-coloured and appears greyish-green (Due to the fact that the underside of the leaves are mostly glaucous - see below) . 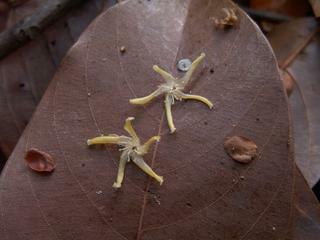 The leaves also grow in small clusters on the branches, and dangling down like small umbrellas. The fruits are winged, like a shuttlecock. There are 3 large wings and 2 short wings, surrounding the nut, the entire fruit about 6 cm from wing tip to nut when ripe. The wings turn red even before ripening. The Shoreas in the reserve are currently fruiting, and their fruits can be seen scattered liberally all over the reserve. 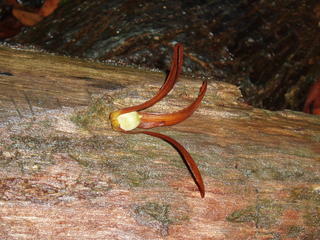 This happens very rarely, about once every 5-10 years, so do come down to check our the Shoreas' winged fruits! "The Big Trees" talks about the rainforest trees and ecology of Singapore's last remaining rainforests, mainly at the Bukit Timah Nature Reserve (BTNR) and Central Catchment Nature Reserve (CCNR), with some mentioning of results from CTFS-AA-NIE's Big Tree Survey.